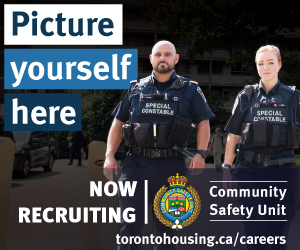 Current opportunities​ with Community Safety Unit (CSU). We are Canada’s largest social housing provider and proudly manage a $9-billion public asset on behalf of the people of Toronto. Nearly 60,000 low- and moderate-income households live in our housing in neighbourhoods across the city. The residents we serve come from diverse backgrounds and include seniors, families, singles, recent immigrants and people with a range of special needs. We connect residents to community services, supports​ and opportunities that help them thrive, providing real social value. Toronto Community Housing is committed to equity in employment. Our goal is a diverse, inclusive and barrier-​free workplace that reflects the communities we serve. We will provide reasonable accommodation to applicants with disabilities at all stages of the hiring process in accordance with the Ontario Human Rights Code, the Accessibility for Ontarians with Disabilities Act, 2005, and Tor onto Community Housing's Accessibility Policy.